Integrated security solutions are the only way to reliably protect connected vehicles against cyber -attacks. These have to take into account every possible risk scenario that might conceivably occur during the entire life cycle of the vehicle in order to develop and effectively implement reliable, risk-appropriate security mechanisms. The threat landscape is constantly changing: every new service based on a vehicle’s connectivity opens up new attack vectors. Besides that, attackers are also continuously perfecting their methods to undermine existing protection mechanisms and find loopholes. That’s why it’s not enough to guarantee state-of-the-art security at the point at which the vehicle rolls off the production line. Instead, this security has to extend to protect against attacks during the vehicle’s operating life. It has to reliably detect and analyze them so that suitable countermeasures can be taken immediately and effectively – for the vehicle in question and, if necessary, for the entire fleet. ESCRYPT’s Intrusion Detection and Prevention Solution provides reliable protection against cyber attacks on vehicles in the field. The solution is based on detection of potential network-level attacks. The embedded component of the turn-key solution, CycurIDS, recognizes anomalies within the in- vehicle communication, based partly on known attack patterns and partly on comparisons to the anticipated communication behavior. CycurIDS thus provides powerful real-time detection to prevent malicious communication from reaching the vehicle’s safety-critical systems without being recognized. 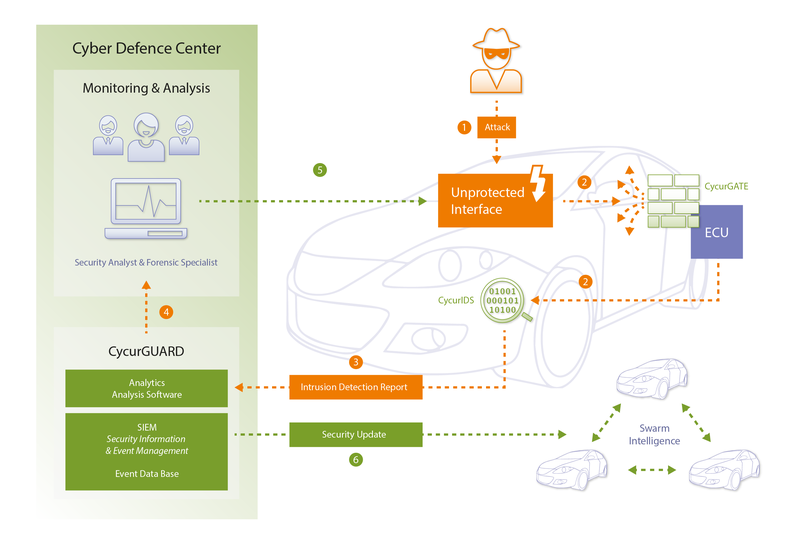 CycurIDS sees the security events on a single automobile – CycurGUARD enables analysis of data from your entire connected fleet to identify emerging threats. With the monitoring back-end product based on big data analysis technologies, ESCRYPT offers an integrated solution for collecting and analyzing anomaly reports of vehicles in operation. With the monitoring back-end product based on big data analysis technologies, ESCRYPT offers an integrated solution for collecting and analyzing anomaly reports of vehicles in operation. CycurGUARD reliably identifies acute threats referring to an extensive and continually growing database of known attack patterns. Using ad -hoc or pre-built reports helps to evaluate the safety and security of the connected fleet, identify changes, focus resources on problem areas, and get ahead of developing threats.